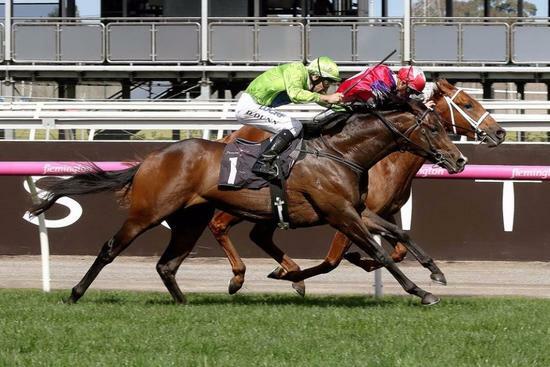 ROYAL Symphony sent an ominous warning to his rivals when he returned to Flemington for the first time this spring and kept his winning streak in tact when saluting in the Listed $120,000 Exford Plate (1400m). His fourth victory was most arguably the three-year-old son of Domesday’s most impressive – caught in a near unwinnable position at the 300 metres – only to mow down his rivals in the most prolific fashion. Saturday’s win was the first time Wingrove Park breeders Joe and Daira Vella were on track to witness their colt in the flesh, and like most punters, were breath taken by the performance. “He showed exceptional turn of foot and determination – not dissimilar to when he was a foal when you used to boss everyone around however it’s just a pleasure to be involved with such a talented horse,” Wingrove Park CEO Joseph Vella explained. Royal Symphony joined the elite company of just two other horses bred on the Kerrie property to be dual stakes winners – Dedicated Miss and Classiconi. What the stocky colt achieves in the next month could catapult the colts value as he tackles the Group 3 Caulfield Guineas Prelude (1400m) on October 1 ahead of the October 14 $2 million Group 1 Caulfield Guineas(1600m). “The Caulfield Guineas is renowned as the stallion making race and it would be an honor to have a runner in the race – we bred him to The Minstrel and Hail To Reason lines and it looks to have done the trick,” said Vella. Not only may the Vella’s have a runner in the race - punters have shortened Royal Symphony to as short as $2.80 for the Group 1 feature post Saturday’s victory which left trainer Tony McEvoy beaming. “I nearly did the old ‘can’t win’ but Dwayne just peeled his way through the field and the way he picked up late is something only special horses do,” said the five-time Group 1 winning horseman. Sold privately in April last year after being rejected entry into the Melbourne Premier Yearling Sale, the colt was purchased by Royal Symphony’s regular rider Dwayne Dunn and wife Amanda after he’d been broken in. Royal Symphony is one of twelve foals to race from the dam Naturalist – eight that have won including black-type earner Hoodlum and metropolitan place getters Diva La Belle and Good Music. The success of Royal Symphony followed on a successful few weeks for the horse stud that welcomed the new racing season with two winners in the space of 24-hours while they also welcomed a flashy Wanted colt from proven producer Dual Spark.